Immanuel Kant strongly stressed the role of duty in his writings. Deontological ethics is a type of ethics and ethical theories. It judges actions based on whether they follow certain rules. It is sometimes described as "duty" or "obligation" or "rule" -based ethics, because rules "bind you to your duty". The Ancient Greek word deon is commonly translated as obligation or duty. Deontological ethics is fundamentally different from consequentialism, which judges actions based on the consequences they have. Another field of ethics that deontological ethics is contrasted with is called pragmatic ethics. 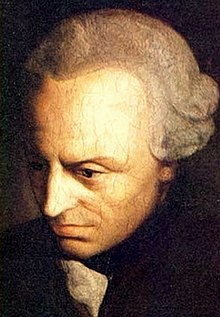 Immanuel Kant strongly stressed the role of duty in his writings. His ethics are commonly called deontological. Some people believe that certain actions are morally right (or morally wrong), regardless of other circumstances such as their consequences or the intentions behind them. This position is commonly called moral absolutism. The term divine command theory is used for a number of related theories that state that an action is right if God has decreed that it is right. William of Ockham, René Descartes and eighteenth-century Calvinists all accepted versions of this moral theory, according to Ralph Cudworth, because they all stated that moral obligations arise from God's commands. ↑ Cudworth, Ralph. 1731. A Treatise Concerning Eternal and Immutable Morality. Reprinted in 1996. Sarah Hutton, (ed.). Cambridge: Cambridge University Press. This page was last changed on 14 September 2013, at 12:55.